Going home for Christmas break, family members are going to ask “so was college everything you imagined it would be?” Undoubtedly, my answer every time will be ‘yes but also so much more.’ With my home being so close to campus (only an hour away), I thought I would go home almost every weekend. Towards the beginning of the semester, I followed this plan. I went home and I worked my job back home about every other weekend. However, I started having such a blast at school that when I was scheduled to work at home for a weekend, I began to dread that weekend and did not want to go home. I had already made so many new friends and it became worth it to stay in the Kalamazoo/Battle Creek area on the weekends. Classes at Western for the first year aviation student are an excellent transition into the college environment. My schedule for this fall was composed of a First Year Seminar, Health and Wellness, Introduction to Aviation, Aerodynamics and Performance, and Instrument Ground School, all the while working towards my instrument rating. The class designed for first year students was beneficial in that my section was fully composed of aviation students so I was able to meet peers in my college. I was also able to see university resources that I ended up utilizing later on in the semester. The health class is a mandatory class for my major and it was interesting because I was able to rock climb every week which was fun! Introduction to Aviation is located in a large lecture hall with about 200 students. The class was interesting and focused on all aspects of aviation’s past, present, and future. Aerodynamics is a class that focuses on the science of air and how an aircraft flies. This is a basic class that every aviation major will take. Instrument Ground School is a class for Aviation Flight Science majors which teaches the students the fundamentals of flying in little to know visibility and how to rely on the aircraft instruments in all phases of flight. I was able to practice this knowledge in the airplane as well, as I was enrolled in Instrument Flying as well and I am now almost finished up with my instrument rating! With my busy schedule and my social interactions with friends, towards the end of the semester I almost never went back home. Some of the best learning in college happens outside of the classroom. Flying in the summer months at Battle Creek, Michigan is, on average, almost 40% more likely to result in experiencing weather conditions that allow flight training to be successfully completed. Flying when the weather is better allows more flight training to be completed. This is a simple statement, but many don’t really look into the details of what it means. While I spent some time working on an article comparing weather at sites across the country in relation to flyable weather conditions for flight training, I drilled down the numbers in much greater detail for Battle Creek because it is home, it is information that directly affects students and instructors I personally know, and the data that I found was strongly trended. Click on the image to see a bigger detailed view of this chart. 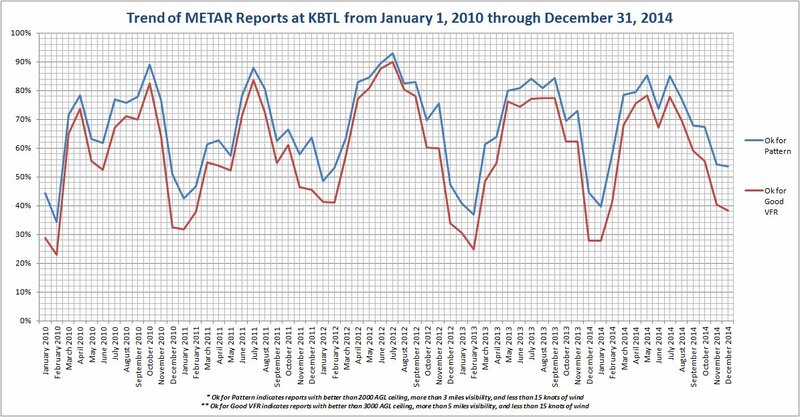 This chart shows the trends of ups and downs that are experienced when broken down by average METAR reports at Battle Creek, Michigan between 2010 and 2015. The trends are pretty obvious. Winter months in Battle Creek have significantly worse weather than summer months. While this is something we all knew anecdotally, now we have the math to prove it. Many WMU students spend Winter and Spring semesters training, then take off the Summer semester. If training efficiency is important, this is probably most important semester of a school year that should be focused on to complete the most training in the shortest periods of time with the least amount of weather delays. If you don’t think it is important, think about it in a broader career perspective. Sure, students have 4 years to complete their training if they plan on completing a degree, but getting through flight training early in those 4 years can have a significant positive effect on an overall flying aviation career. A student that gets through their private, instrument, commercial (single- and multi-engine) and their CFI early has an opportunity to instruct as they finish their last year or two of coursework. This transition is important if a pilot is focused on getting enough flight time to meet ATP minimums (even restricted ATP requirements). Follow me through this. A pilot that gets their training done by, for example, the end of their Junior year has an opportunity to accumulate instructional flight hours during their Senior year, helping them get valuable flight time (and let’s be honest, getting paid to do it is not a bad thing either) that will be applicable to hiring minimums later. Any delay in getting these hours pushes a hiring date with an airline (or any other commercial pilot job that requires an ATP) further into the future. Every month, year, or decade of delay means lower career earnings potential. Again, this shows the high points of good weather as during summer months. If I were looking to training in Battle Creek, or I had a son or daughter doing so, I would look to try to find a way to make sure my education at WMU became a year round effort, not just Winter and Spring semesters when the weather is sure to force delays in training. My money would be on making sure I was doing some flight training through the Summer semesters. It’s a bit dorky to drill down this math, but it is highly illustrative of our local weather conditions and how they can affect out training environment. Want to know more about the math behind it? Well here it is (in case you want more detail). 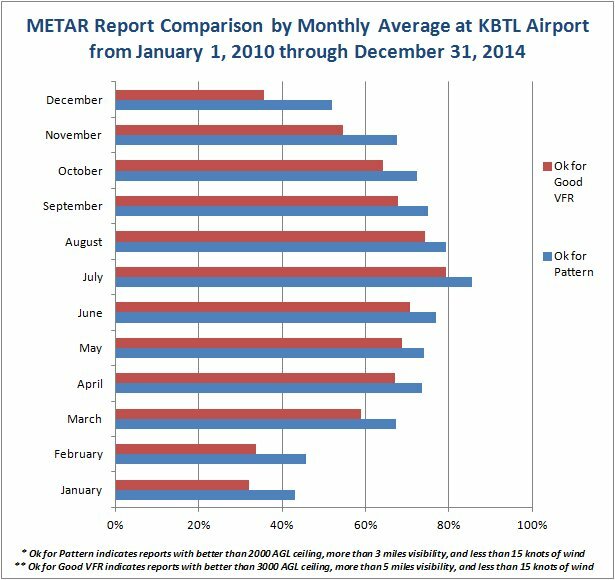 To get this data, I pulled every METAR report from January 1, 2010 through December 31, 2014 and compared them. 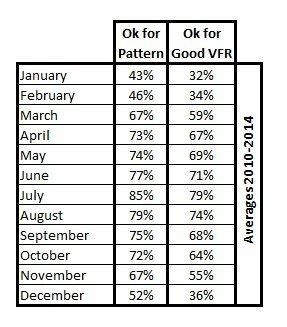 The percentages given in this data are equated to “Ok for Pattern” and “Ok for Good VFR” labels. “Ok for Pattern” means a METAR reported ceilings better than 2000′ AGL, visibility better than 3 miles, and less than 15 knots winds. “Ok for Good VFR” means a METAR reported ceilings better than 3000′ AGL, visibility better than 5 miles, and less than 15 knots winds. These two broad characterizations are basic considerations of whether a pilot trying to fly (or train) could either fly traffic pattern or go out to a practice area to do most training maneuvers prescribed in practical test standards. I didn’t bother trying to analyze if instrument training could be completed because so much of the time in the winter when there are clouds, icing is present, and we can’t fly anyway. The data reports in percentages indicate the percentage of reports in each month or the averaged month that meet the established criterion. When considering these data points on a monthly trend or as an average for each month over the years, the trends follow a pattern that matches our anecdotal experience. The key is now that we have the data, trying to use it to change how we view the pursuit of training in our environment. I doubt that WMU’s College of Aviation will discourage students from staying around for summer weather training. In fact, I would bet it would be welcomed. To view more of Jason Blair's blogs, please visit http://www.jasonblair.net/. The biggest part of your pilot training will always be using the knowledge you have learned to pass the practical test or check ride. You must complete a check ride for each rating that you receive. Each checkride consists of a ground/oral discussion and a flight portion. No matter what anyone tells you, you will be nervous. There is just no getting around it. The nerves are good; it means you are taking the test seriously. To help cope with your nerves, I want to give you some tips that seem to help relax me a bit before each check ride I take. Along with the tips I’ll share a few of my own stories and experiences with you. The first tip is to get some good sleep. You will want to be up all night looking over the last minute parts of planning and questions but don't sweat it. Getting a good nights sleep is far more important so you can actually focus during the test. Before my first check ride, I stayed up until three in the morning trying to review last minute things. It definitely was not worth it in the end. I was very tired in the morning and it was harder to focus during the test. Eat breakfast before is tip number two. Going into the ride on an empty stomach will only make you feel worse. You might even get sick on the flight, which would not be good. When I did upset recovery and spin training, I was told to eat a banana before each flight. Bananas help prevent upset stomachs. So this would be a good thing to eat before a checkride just in case. Tip number 3 would be to create conversation with the examiner. They are just people too and are not out to get you. Getting to know the examiner will make them more comfortable around you. If they are more comfortable, it won’t seem like they are trying to just grill you with questions. They want to see you pass just as bad as you want to pass. The most recent checkride that I took was probably the easiest one I have had so far. It wasn’t easy because the information and maneuvers were easy; it was because I felt very comfortable with the examiner. It felt just like casual conversation during the oral exam and the flight felt as if I was flying around a friend. Only at the end of the test did I actually realize I was providing and demonstrating all my knowledge to him. And lastly, don't open doors that don't need to be opened. The examiner won't try to trick you so go with the answer that pops up first. The more you beat around answers, the bigger hole you can dig yourself into and will lead the examiner into asking tougher questions. I did this once a while ago. Instead of giving just the one sentence answer, I tried to sound smarter by making it wordy. By trying to sound smarter, I ended up rambling and saying something incorrect. The examiner caught it and then he dug deeper into that particular subject. Believe me, this is not something that you want to happen. These are just a few things that I like to do and think about when I'm taking my check rides. Hopefully you can use these tips for your next practical test and can learn from some of my experiences and apply them to your test. After it is over, you will always think that it wasn't that bad. It won’t be that bad because you will have all the knowledge for it. And remember, your flight instructor won't send you on the checkride unless they know that you can pass it. So if you are about to take one, you are ready! The biggest part of your pilot training will always be using the knowledge you have learned to pass the practical test or check ride. You must complete a check ride for each rating that you receive. Each check ride consists of a ground/oral discussion and a flight portion. No matter what anyone tells you, you will be nervous. There is just no getting around it. The nerves are good; it means you are taking the test seriously. To help cope with your nerves, I want to give you some tips that seem to help relax me a bit before each checkride I take. Along with the tips I’ll share a few of my own stories and experiences with you. These are just a few things that I like to do and think about when I'm taking my check rides. Hopefully you can use these tips for your next practical test and can learn from some of my experiences and apply them to your test. After it is over, you will always think that it wasn't that bad. It won’t be that bad because you will have all the knowledge for it. And remember, your flight instructor won't send you on the check ride unless they know that you can pass it. So if you are about to take one, you are ready! I had my landing spot in sight and started to go through the aircraft’s checklist. I was 1,000 feet above where I wanted to land and flying the traffic pattern spot on. I turned base, checked my airspeed, and it was good. I turned final, added full flaps with another glance at the airspeed indicator. Coming over the trees I went power idle and started my flare. I knew I made contact when I heard SPLASH! Normally airplanes are in emergency situations when they land on water, such as the Miracle on the Hudson, US Airways flight 1549. This was no ordinary airplane; this was Western Michigan University’s College of Aviation seaplane, a beautiful Piper Super Cub on amphibious floats. The airplane was originally a conventional tail dragger, like most of the Piper Cubs flying today, until a project was undertaken by Western Michigan University’s College of Aviation maintenance faculty to install floats. When I was a prospective student, I toured the College of Aviation and fell in love with the seaplane and knew I wanted to fly it. I started my flight training at Western Michigan University’s College of Aviation in the fall of 2010 flying the Cirrus SR-20 working on my private pilot’s license. I had flown occasionally in high school but not with the intention to receive a license. I loved flying the Cirrus SR-20 especially with the Avidyne R9 Avionics. The Cirrus SR-20 and Avidyne R9 can do just about anything an airliner can. Later, in my instrument rating course, I would learn its full potential; I really felt like I was the captain on a jetliner. Once I completed my commercial single engine license it was finally time to start my seaplane training and I still remember getting into the seaplane for the first time. It was a tight squeeze compared to the Cirrus SR-20 that I had been accustomed to. It was also the first airplane I’ve flown to have tandem seating. The cockpit was also very different. I’d flown airplanes with steam gauges before, notably WMU’s Piper PA-44 Seminole and PA-28 Arrow for my commercial multi and single engine licenses, but the seaplane had the most minimalist cockpit I’ve seen. It did have a GPS and transponder but it didn’t even have an attitude indicator. I asked my instructor about the lack of an attitude indicator to which he responded: “who needs an attitude indicator when you have the horizon” and pointed to the windscreen that offered great visibility. I completed my preflight inspection, which was just like any other preflight inspection I’ve done, except now I had to pump the excess water out of the floats. I started the engine and taxied to the runway, added full power and off we went. The airplane lifted off the runway with little hesitation. I had become familiar with the practice areas over the two years I had been a flight student but I was always at higher altitudes. Since the lesson only entailed take off and landings on water, there was no need to climb above one thousand feet above the ground, and now I could see the farm fields and country roads with better detail. Within a few minutes, we had arrived at one of the lakes in the local area. I noticed the lake had a few waves but for the most part was pretty flat. I surveyed the area, runways usually don’t have boats or jet skiers but the lake can be a different story! On a related note, during one of my flights there was a jet skier who wanted to race us as we took off. There weren’t any to contend with that day so I had the lake all to myself. I flew my pattern, usually there are not any houses or trees right next to an airport’s runway but on lakes the shoreline is prime real estate. It was a very cool feeling to be just feet over someone’s house right before we touched down. I saw many cool things during my few hours in the seaplane. After about three weeks of training I successfully passed my seaplane check ride. The seaplane course at Western Michigan University was definitely something I will remember for the rest of my life. Education is an art. When done correctly, the educator is often able to synthesize understanding of a complex concept like a chef creates a confectionary delicacy. However, very often it is disguised in assessments, pencil and paper tests, and data. When this happens, the ability to approach a complex subject is lost. The learner is reduced to a passive participant, digesting the material using only one sensory input. Nowhere else is this more evident than in the reports of airline emergencies. More often than not, the transcripts of these events are recorded and documented. The text of the crew, their actions, the response of the aircraft, all of these written in black and white to be analyzed and interpreted for years. While the data is important, there is something lost: the voices of the individuals. Much like certain educational subjects, these aviation events are anything but simple. Instead, they are incredibly complex requiring a unique approach to their teaching. Most of the times, these events are read. However, through the readings, we lose the nuances and interactions between the crew; we fail to see the emotions, the conflict, grief, anger and despair. The film Charlie Victor Romeo brings these incidents to life, allowing the viewer an intimate look into the situations that lead to these events; providing an incredible and unique educational opportunity. Using the art of theater, Charlie Victor Romeo projects the human element to these often tragic emergencies. As a result, the film is a must see for everyone involved in aviation. At Western Michigan University’s College of Aviation, students learn about many of the incidents portrayed in the film. The students read and discuss the emergencies: what occurred, how the crew handled the situation, what they did well, what they could do better. What the text lacks, Charlie Victor Romeo brings to life. As is true of any theatrical representation, the actors are able to showcase the hidden parts of the transcripts. The dialogue of the actors is derived entirely from the “black box” transcripts of each of the six aviation emergencies highlighted in the movie. However, missing from the transcripts is the perspiration, angst, and frustration the actors demonstrate through each of the events. The ability to watch a person go through the stress of these situations adds another dimension to any collegiate or professional discussion. The use of this film as part of any academic discussion regarding these aviation emergencies should be highly considered. Using the film in conjunction with the actual transcripts allows the educator to blend the art with the science. Melding the faceless black and white text with the gamut of emotions projected by the actor, a student begins to see the events in a different light. They are able to witness the dedication of the crew, their ability to fight through the situation, and sometimes their inability to perceive the situation unfolding in front of them. While the transcripts lack the intensity of a John Grisham novel, the actors are able to infer the gut-wrenching emotion felt by the various crew members represented. Ultimately, what the movie brings to light is the human element. To highlight the benefit of using the film Charlie Victor Romeo in order to educate future aviation professionals about past aviation incidents, all one must do is think about Shakespeare. Many a college freshmen has sat through a class on Shakespeare: reading and discussing the Bard of Avon’s work. Students would read, decipher and write about the various sonnets and plays, but they rarely connected to them since the text always lacked a certain “pizazz.” The wonder of Shakespeare required a student to sit in an auditorium and watch “Macbeth” come to life. The interpretation and presentation of the actors filled in the missing components. All of which led to a deeper and more meaningful understanding of the original tale. The production added nothing to Shakespeare’s words; however, the work of the actors provided that “little bit” which helped to generate a more a complete understanding of the source material. The actors in Charlie Victor Romeo provide the same opportunity for those wishing to understand the nuances in the explored aviation emergencies. The ability to immerse a student into a subject is paramount to learning. Many times, educators have found that to educate, one must also entertain. Marshall McLuhan summed it up when he stated, “It’s misleading to suppose there’s any basic difference between education and entertainment.” By combining the educational value of analyzing these aviation emergencies with the entertainment medium presented through the art of film, students are able to submerse themselves fully in the examination of these events. Hopefully, through careful examination, the experiences of the past will help to prevent similar events in the future. Western Michigan University’s College of Aviation was proud to be the fourth professional screening of the film Charlie Victor Romeo. Students, faculty, staff and the public were invited to the screenings that took place on April 9 and 10, 2014, at the Alamo Drafthouse in Kalamazoo, Mich.
WMU is committed to providing its students with an education that is second to none and will prepare them for a successful career in aviation. One of its most effective courses for ensuring a successful transition is the Jet Equivalency Training (JET) course. The following attest to the course’s success in readying WMU flight students for the rigors of training at a regional airline. Computer Based Training (CBT) – 2 weeks of self-study prior to starting classes. Instruction consists of 25 modules of web based CRJ-200 systems training. Academics – 5 days of instruction in the classroom. Topics include CRJ-200 flight crew normal, abnormal, and emergency procedures, and a review of aircraft systems. Simulation – 10 days of flight instruction in a CRJ-200 flight training device (FTD). Each day consists of a 1½ hour pre brief, 4 hours of FTD instruction, and a 1 hour post brief. The time in the FTD is equally divided between pilot flying and pilot not flying duties. Scenarios begin with basic handling and are performed in a two-crew environment. As proficiency grows, students learn to contend with abnormal and emergency situations. After students experience operations in a variety of conditions, they explore flight crew use of automation and realistic airline operations. The phase culminates with an airline style checkride. To simulate the “fire hose” nature of regional airline training, the JET course is usually conducted Monday through Friday until all lessons are complete. Therefore, the course can be completed in as little as 3 weeks. Due to student schedules and academic commitments, the course can be scheduled on a less hectic basis, but still should be conducted for at least three days a week to maintain its intensity. AVS 3560: Professional Flight IV Lab. AVS 4110: Airline Flight Operations. AVS 4120: Line Oriented Flight Crew Simulation. Commercial Pilot license with Instrument and Multi-Engine ratings. A Certified Flight Instructor (CFI) license is not necessarily required. Why should students take the JET course? The best reason is because it works. In the past, six regional airlines agreed to lower their job interview flight hour requirements for JET course graduates. The upcoming enactment of aviation legislation will mandate specific flight hour minimums for first officers which will nullify these agreements. However, the regionals still express their support for the course. For example, ExpressJet Airline, the world's largest regional airline, worked with WMU to establish a Pilot Pathway Program. If students pass a rigorous screening process and get accepted into this program, they will be guaranteed jobs as first officers with ExpressJet and, later on, interviews with Delta Air Lines. Part of the screening process for the program is the JET course. Who teaches the JET course? The primary instructor for the JET course is Dennis McFall. He has over 34 years of aviation experience which includes working in a training center transitioning ab initio flight students to jet transport aircraft. Dennis has been with WMU since 2000 and was instrumental in establishing the university’s airline transition training. How healthy are you? This is a question we often ask ourselves; one that requires a hard, reflective look at life styles, personal habits, and medical issues. In the world of aviation, the overall health of a pilot is a major concern, reinforcing aviation's highest priority: safety. All pilots are required to obtain some type of medical approval. For those entering into the professional ranks of the piloting world, a class 1 medical is required. This type of medical exam is the strictest type of medical approval. Prior to beginning a professional aviation training program, consulting with an Aviation Medical Examiner (AME) is highly recommended. At Western Michigan University, which is a FAR Part 141 training institution, we encourage all students in our flight school to obtain their class 1 medical to ensure they are able to pass the examination required to be a professional pilot. You aren’t sure where an AME is located or how to find one? Easy! Check out the Federal Aviation Administration (FAA) AME locator and pinpoint the nearest AME. Western Michigan University is proud to employ an AME, who is available to all flight students. Dr. Gregory Pinnell, Adjunct Professor at WMU's College of Aviation has an examination room here on campus, making medical exams easy and convenient for WMU students. There are many exceptional resources available when researching flight physicals conducted by an AME. safety and make the trip more enjoyable! signs and symptoms. Contact us for more details. "Is there anyone out there who has managed to miss the nasty respiratory bug that is going around? This time of year we frequently need to “self-treat” symptoms with over the counter (OTC) medications due to colds, flu or even the remains of seasonal allergies. Most of us know that many of these medications can cause drowsiness. The most common “relief” medication is Benadryl which is an antihistamine. It is often forgotten that the effects of this drug can last 4 hours and can take over 8 hours to get half of it out of your system. Pseudoephedrine is allowed by the FAA as a decongestant but it is always best to wait till all the symptoms are gone and you have been off the OTC’s for at least 24 hours before flying. Fly safe and keep the Kleenex nearby!" Big changes are coming in FAA Aeromedical Certification. The biggest will be a new program called Certificates an AME Can Issue or “CACI”. This will involve about 18 different medical diagnoses which previously were special issuance conditions generally requiring yearly documentation to go to the FAA. Now your AME will ask you for supporting medical documentation about your condition and, if you meet the criteria and are otherwise qualified, they can issue a normal duration medical certificate. The AME does not even need to forward the medical documentation to the FAA. The specific diagnosis have not been announced but they will likely show up in March 2013. This program will reduce waiting time for medical certification and free up FAA time for more complicated cases. Feel free to call or write if questions. Fly Safe! Dr. Gregory Pinnell is a board certified family practitioner/Senior AME licensed in Michigan. He serves as a Senior Flight Surgeon for the 434th Air Refueling Wing, Grissom Air Reserve Base. Dr. Pinnell works with the Department of Defense Human Space Flight Support and has worked multiple Space Shuttle missions. He is a veteran of Operation Noble Eagle, Enduring Freedom and Iraqi Freedom having been deployed to the Persian Gulf in 2002 and 2004. He was also deployed in support of the Balkan’s Operation Joint Forge. Dr. Pinnell serves as an adjunct professor for Western Michigan University’s College of Aviation. Internships come in many sizes, shapes and disciplines, but most everyone agrees that an internship will do wonders when applying for first career jobs. Internships offer a practical way to apply skills learned at educational institutions in a workplace setting. Additionally, they supply students with an understanding of how the knowledge gained in an academic setting will merge with a modern work environment. At Western Michigan University’s College of Aviation, students are encouraged to take part in numerous networking opportunities throughout their tenure at the University. The flagship event is Aviation Outlook Day, taking place this year on April 5, 2013. Since its re-launch in 2010, the program has consistently grown both with the numbers of companies participating and students attending. All students are encouraged to attend and learn about career opportunities and information from the aviation company representatives who ultimately hire WMU College of Aviation graduates. Many of the companies attending Aviation Outlook Day offer internships for students. These internships are available to all students and all degree programs at the College of Aviation. Don’t take it from me; data from WMU’s Career Services support the power of internships. Of those students reporting full time employment after graduation, 60% had an internship prior to graduation in 2012. If you are a student reading these numbers, you now realize the necessity of pursuing an internship opportunity while an undergrad. Not only will this provide you valuable real-world experience, the opportunity will also heighten your chances obtaining full time employment post-graduation. High internship completion numbers exist for students studying Aviation Science and Administration, also known in many cases as Aviation Management and Operations and Aviation Maintenance Technology. An impressive 33% of Aviation Science and Administration graduates who reported full-time post-graduation employment had an internship while attending WMU. Even better, 55% of Aviation Maintenance Technology graduates who reported full-time employment participated in an internship while studying at Western Michigan University. Many students who study Aviation Flight Science (Professional Pilot Training) often fail to realize they too should participate in internships. These experiences enhance networking opportunities and raise job prospects for students upon completing their education. Aspiring pilots need a good understanding of the business that surrounds the aircraft as well as how to operate it. Many aviation internships do a great job at demonstrating the inner workings of an airline, corporate operation or other aircraft operations. Dave Powell, Dean of the College of Aviation encourages students in the Aviation Flight Science curriculum to focus on being both an exceptional pilot and an individual who understands the business behind the aircraft. Knowing the business aspect of aviation enhances the marketability of post-graduates seeking employment, and may set pilots apart from their peers. Internships do a remarkable job of putting the finishing touches on this part of a student’s education. After reviewing data, internships are a no-brainer. Students interested in pursuing exceptional internship opportunities are encouraged to subscribe to the College of Aviation internship blog. Subscribers will receive e-mails sent on a weekly to bi-weekly basis. These notifications will provide students multiple opportunities to learn about internship opportunities and indicate the deadlines and time frames that are critical for obtaining an internship. Students are also provided a forum to ask questions and receive advice about the opportunities. As mentioned earlier, internship opportunities abound at many companies and organizations. One company in particular, offers a great internship program which highlights all aspects of corporate aviation. Northern Jet Management offers multiple length, year-round internships that build additional skills sought by companies hiring aviation graduates. As a company specializing in corporate aviation, Northern Jet Management offers internship opportunities highlighting many aspects of the industry: aviation business, maintenance, operations, and even flight. Students in the Aviation Science and Administration (Aviation Management and Operations) curriculum interested in corporate jet operations, fixed based operator management, or aircraft sales would be wise to apply for this particular internship. Learn more about careers in Aviation Management and Operations by clicking the the button below. Northern Jet Management is a corporate aviation management company that specializes in turnkey aircraft and flight department management. Northern Air, Inc. is a Fixed Base Operation that provides full line and concierge services as well as aircraft maintenance. To learn more about this great company, please click here. Northern Jet Management and Northern Air, Inc. partner with Western Michigan University for aviation internships and career opportunities in West Michigan. Our internship opportunity allows the student to experience maintenance, flight operations, customer service, and participate in job shadows with aviation management and senior leaders. Western Michigan University students studying in the Aviation Science and Administration, Flight Science and Aviation Maintenance Technology programs gain a knowledge base that prepares them for aviation opportunities including the company internship program with Northern Jet Management and Northern Air, Inc. Previous experience is vital when students are looking for careers after graduation. Since students can build an internship around their area of interest at Northern Jet Management, the opportunity offers them a chance to apply their knowledge learned at WMU to the aviation workplace. Not a Western Michigan University aviation student? Find out how you can join an in demand career that is exciting and valuable. Learning to fly is expensive. Figuring out how to come up with the money needed to accomplish your dream of being a pilot may not be as hard as you think. Financial aid is a good way to pay for college. Financial aid can be made up of scholarships, grants, work study, federal student loans and federal parent loans, as well as alternative loans. One of the first places you should look is Western Michigan University’s Financial Aid website: www.wmich.edu/finaid/undergrad. This website walks you through the steps you need to take. Filling out the Free Application for Federal Student Aid (FAFSA) is the very first step to take. This allows you to apply for federal student financial aid, such as the Pell Grant, student loans, and work-study. A Pell Grant is a monetary award that doesn’t have to be paid back to the government. It’s only given to undergraduate students who haven’t yet earned a bachelor’s or a professional degree. The amount you get depends on a number of factors, including how much you can contribute financially to your training, tuition costs, your own financial need and more. There is a maximum amount you can receive per year, but the good news is that you can apply for Pell grants multiple years. The Stafford Loan is the most popular federal loan program. Stafford Loans are low-interest loans and are for students with demonstrated financial need. These loans have a six month grace period after graduation before repayment begins. The Stafford program also offers “direct unsubsidized loans” that don’t require financial hardship. The amount available to a student each year is dependent on need and the grade year. These loans also have a six month grace period after graduation before repayment begins. The Federal Stafford Parent Loan for Undergraduate Students (PLUS) loan can be borrowed by the parents of the dependent undergraduate student to help pay for their child’s education. The PLUS loan is not based on financial need. The amount a parent can borrow each year is limited to the cost of attendance less other forms of assistance. Repayment on Parent PLUS loans begins 60 days after the loan is fully disbursed. Federal Direct Loans, like the Stafford Loan, pay out based on need and the grade year. The Federal Perkins Loan is a federal loan with limited funding. The loan is repaid to the school you attend. This loan has a fixed interest rate and is awarded to students with significant need. Repayment on this loan begins nine months after you are no longer enrolled at least half time. During this time, interest is also deferred. Once you have exhausted your eligibility for state and federal financial aid and loans, you may need to consider applying for a private educational loan, also called an alternative loan. These loans are not federal student loans. They are offered by private lenders and are used to supplement your financial aid. Let Google be your friend and do a search for aviation scholarships and scholarships specific to your discipline: flight science, aviation maintenance technology, aviation administration, aviation management. Search on words related to aviation such as part 141, pilot’s license, etc. What about your parents’ place of employment, churches, organization your parents or other relatives belong to, sports team…think outside of the box. Once you have exhausted your eligibility for state and federal financial aid and loans, you may need to consider applying for a private educational loan, also called an alternative loan. These loans are not federal student loans. They are offered by private lenders and are used to supplement your financial aid. Every alternative loan program is different. In an effort to help you make informed choices, Western Michigan University has created an alternative lender worksheet, The Bottom Line, which will help you select the private lender that is right for you. If you have done or are willing to do recent U.S. military service, you will be able to fund your flight training via the GI Bill. If you served in the military for at least 36 months after September 11, 2001, you’re eligible for 100% of the benefits of the Post-9/11 GI Bill. This Bill says that 100% of your tuition will be paid; you will receive a monthly housing stipend and a stipend of up to $1,000 a year for books and supplies as well as a flight-training-only reimbursement of $10,000 per year. If you serve less than 36months, you’re eligible for a percentage of these benefits, based on your time served. Details of the Post-9/11 GI Bill and dependent benefits are available at www.gibill.va.gov. Thinking about an aviation career? This career guide will be a wealth of information to get you up to speed on what an aviation career can do for you! Inside the guide you will find valuable information on researching the career and even researching aviation schools to get to that career. Click the button below to view your free Essential Pilot Career Guide! Ready for an aviation career already? Check out Western Michigan University's College of Aviation's exceptional program by requesting information below.